The bald Faced Hornet, also called White Faced Hornets, are members of the wasp family. They are known for making large, enclosed paper nests that generally consists of a small entrance hole usually near the bottom. Larger nests may have more than one entrance hole. I know from personal experience their sting is quite painful. The average sized nest is about the size of a football, but can get many times larger. The hornets are fast fliers and can quickly swarm any potential threat. They are most aggressive when protecting the nest. Their bad reputation is well justified when defending the nest. I can personally testify to this because I have been stung multiple times in a single attack. When on the attack, they are so fast there is really nothing you can do except run. You don't need to be actively irritating the hornets at the moment you are stung. Once you get in their sights, you can leave for a short time and then come back and they will actually fly past other people to sting the person they know was causing them problems. That is exactly what happened to me. C.S. Lewis said, "Experience is a brutal teacher, but, by God, you will learn". Many Hollywood movies have played on the wasp’s fierce reputation. I recall a John Wayne movie that included a scene where a bald faced hornet nest was thrown into a train. There was also the movie "Man of the House" with Jonathon Taylor Thomas and Chevy Chase. In this movie, Thomas rigs a trap using a large hornet’s nest that drops onto the bad guys. When living on the North Fork of the White River in the Missouri Ozarks, a neighbor spotted a bear climbing down from a tree near his house. For some reason he rushed out and hit the bear with a stick to chase him away. The bear ran off. However, unbeknownst to my neighbor, the bear had been swatting at a hornet's nest. As the neighbor was turning to go back to the house, the hornet nest fell from the tree hitting the ground. He was immediately attacked by dozens of angry hornets receiving hundreds of stings. While it is true that bald faced hornets do have a bad temper when their nests are disturbed, they are generally not a problem when found away from the nest. In fact, bald faced hornets are actually beneficial insects. They kill other small insects, including flies, that are fed to the young. Each nest consists of a queen, worker hornets, and drones. The workers are all female and are responsible for all stinging attacks and nest building. The drones are all male and have no stinger. Their job is to mate with certain females whose offspring will become queens. The female bald faced hornets are often seen on untreated wood surfaces. They work tirelessly removing wood fibers used for nest construction. The nest starts off small, the size of a baseball, becoming oval shaped as it grows. 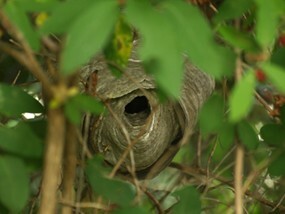 Inside the nest is the standard waffle pattern that contains hornet larva. Before summer ends, it can be over two feet long and hold several hundred hornets. Nests are most often built in trees. When built in trees they become almost invisible. Most people never even know it is there until the leaves drop in the fall. They do not reuse an old nest and start with a new nest each year. Bald faced hornet nest removal becomes necessary when the nest is close enough to the house that they become a threat to you or family members. They will build nests in hedges, on the sides of houses, underneath carports, inside barns, attics, and even the underside of sturdy patio furniture. The hornets must be killed before removing the nest. The easiest method of killing bald faced hornets is to use a "Wasp and Hornet" spray that says "Immediate Knockdown Power" or "Kills on Contact" on the label. They can be purchased at most hardware stores and even some grocery stores. Don't expect the spray to kill immediately. (Their definition of "immediate" is different than mine.) Some will drop, some will cling to the nest and some will fly a short distance even when coated with spray. Do not use sprays labeled for flies, mosquitoes, or other flying insects. Do not use "fogger" type sprays. They don’t have the knockdown power and you will probably get stung. Hornet stings are painful, especially multiple stings, so don’t chance it. The product you use must be labeled specifically for wasp and hornets. Do not allow children to spray the nest, it is a job for adults only. Children may not understand the danger involved. Bee and hornet stings may look cute on "America’s Funniest Videos", but if you have ever been attacked, you know it is not that funny. The one good thing about the newer cans of hornet and wasp killer sprays was the lack of damage to plant tissue. Just 10 years ago, if you sprayed a can of hornet killer into the trees, it would kill all the leaves the spray touched. Lately, I have noticed that little damage was caused with the hornet sprays I have used. It may not be that way for every type of spray hornet spray. The best time to spray is in the morning hours when the air is calm and cool. Make sure there is sufficient light to see clearly. Aim the can at the entrance of the nest and continue to spray until the can is empty. It will take under a minute. The spray will coat most of the nest killing the larva and adults. For large nests have an additional can in your other hand ready to spray. You don’t want to run out before the job is completed. The inside of the nest will offer some protection from the spray. It may take a couple days before it is safe to approach a bald faced hornet nest after it has been sprayed. There will always straggler hornets that will show up at the nest minutes to hours after you have sprayed it. These wasps that arrive later were out working gathering pulp or food. Be on the watch out for them if you decide to remove the nest fairly quickly after spraying. The picture on the can shows the can shooting a jet stream of spray at the nest. Cans used to do this, but I haven't gotten a can that will shoot a solid jet stream like that. Although some cans are labeled to shoot up to 27 ft. they are not accurate at that distance. Expect the jet stream to start breaking up and spreading out at about half the stated distance on the can. I just tested (Nov 2012) a can with 27 foot distance claims and it broke up at six feet! Unbelievable! With the slight breeze I got maybe 10 feet out of the stream. You should always test the stream away from the nest first, but only for a second or so. You will loose too much spray if you test the stream too long. Important: The maximum distance from the nest should not be much beyond the point where the stream begins to break up. This is because the stream will need to hit the nest and entrance hole with some force. If the stream breaks up before it hits the nest and only coats the outside and will not have any knockdown power. You will likely have to spray it again after they have calmed down. Instant Kill Claims: I guess it really depends on the manufacturer's definition of "Instant", but if a bald-faced hornet flies off after being sprayed, it is not instant in my book, even if the hornet dies shortly after. Be careful of that. It is very dangerous to use gasoline, kerosene, or diesel fuel. It is dangerous and you can get severely burned if it somehow ignites. Attempts at throwing a bucket of gasoline on the nest will probably get you stung. This is especially true if you miss the target. You will probably only get one attempt at it. If your plan is to stand in front of the nest to spray, you must dress appropriately. Wear lots of padding. You should wear at least two pairs of loose fitting jeans, several shirts or a thick jacket, a large brimmed hat with netting over it. Tape the netting to your jacket or shirt while leaving enough slack for bending. Tape off all openings and the bottom of your pants and shirt sleeves. Wear leather gloves. Caution: A person I know used netting over his hat when spraying a hornet’s nest, but the netting was touching the tip of his nose. One hornet stung him on the nose through the net. Make sure the netting is not resting on your skin. Have an escape route established should something go wrong. Make sure no one else is in close vicinity when you start spraying. Move your pets inside as well. If hornets are anything like honey bees, they will break off the chase before 300 ft. (Not so for Africanized bees where attacks have continued for over 1000 ft.) Make sure your escape route is opened ended should you need more distance. Depending on the location of the nest, the following advice may be helpful. A few weeks ago I killed a small bald faced hornet nest that was in a shrub several feet from our basement door. I was able to get within 5 feet of the nest by spraying from inside my car. 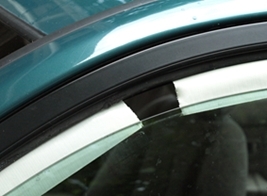 What I did was lower my driver’s side window a few inches and placed duct tape across the opening leaving a three inch gap in the middle. This small gap is where the can's nozzle is placed. I pulled the car directly in front of the nest and began spraying. I had one finger on the electric window switch should there have been a need to raise the window quickly. I didn’t need it. I was able to kill the entire nest and took it down two days later. It is important to wear eye protection. Since your eyes will be on the nest and not the can, should the can move slightly allowing the stream to hit the tape, it could easily splash pesticide into your eyes. Place a towel directly under the can before you start spraying. Some of the pesticide always drips down the can and could drip on the arm rest or elsewhere in the car. Wash off the outside of your car after spraying the nest. You will certainly get pesticide overspray on the paint surface. Applying a flea medicine on your pet is the first step in preventing an infestation. Click here to see some of the better products and how they are applied. Did You Know...? Hornets are beneficial insects and are usually only aggressive when protecting the nest. Did You Know...? The spray distance listed on the can should not be trusted. I have seen cans with a "27 Foot Stream" break apart at 6 feet. Always do a 1 second spray test in a safe direction away from the nest.